I'm delighted to be able to bring to you today the great Rockin' Green dish detergent review and giveaway from my friend Michelle who is a contributing blogger over at The Nurse Mommy! Take a look and enter to win yourself some rockin' product! Welcome to the Rockin' Green Giveaway! 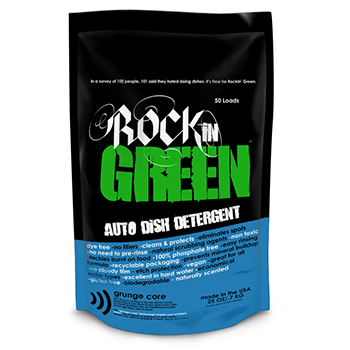 I'm excited to share that we have a giveaway for our readers for a package of Rockin' Green Automatic Dishwasher Detergent. Check out Michelle's Rockin' Green Auto Dish Detergent Review over at The Nurse Mommy. Wanna win it? Enter below! Wanna buy it? Buy Rockin' Green on Amazon! We use classic bare naked babies for our cloth diaper stash! I would love to try the Smashing Watermelon! Sounds like it would smell fantastic! I would like to try their soft rock laundry detergent. I need a new detergent for my soft water.